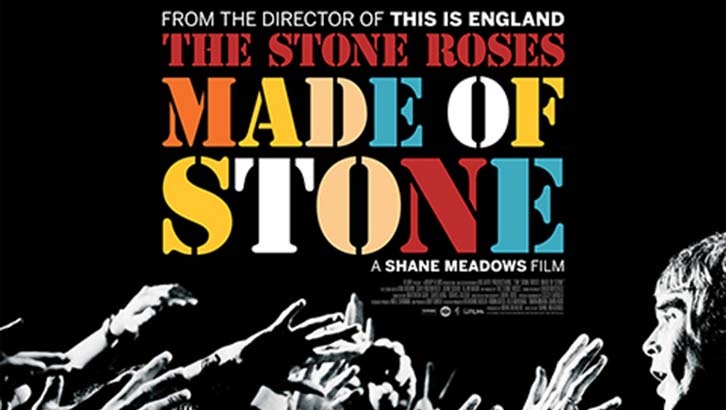 Having looked at Spike Island in Part 1, we’ll move on to a look at Made of Stone which was released to DVD on October 21st. This is specifically an appraisal of the film in terms of the DVD package having reviewed the cinematic release in full last May. However, to very briefly recap this is acclaimed director Shane Meadows’ documentary tribute to the reformation of iconic Manchester band The Stone Roses. A fabulous celebratory experience for fans, the film both benefits and suffers from being an unashamed love-letter. Centering on the comeback concerts at Heaton Park last year, Meadows is largely kept at arms length by the band and falls short of telling a more potent story. Now here on video release, I for one was desperate to see how it would be packaged. Thankfully mad collectors like me are treated to numerous versions to pick up, carrying tantalising extras. With a whopping 2 hours of additional footage, clips and interviews it seems fans won’t be disappointed. As with Spike Island we’re looking at the premium Blu-ray, in this instance a 3-Disc Steelbook which is presented beautifully. A brushed steel case features stylised poster artwork and sports one of those neat wraparound cards detailing the feature. Inside the box you get the Blu-ray disc and DVD-equivalent for the film feature itself and then a dedicated disc of extras. Somewhat incredibly though and totally unexpected is that this pack in fact comprises 2 Blu-rays, with the extras presented in glorious HD wherever possible. This isn’t always standard even on most big-budget Hollywood releases and Film4/4DVD must be applauded here. As a result the menus look great, the extra footage matches the quality of the feature and the 5.1 DTS/HD sound is brilliant. Big question is though, are the actual extras worthy such grandiose treatment or in some ways like the movie a tantalising bluff? It’s safe to say that anything ‘juicy’ won’t be dished out here, if you longed for more fly on the wall backstage moments. We’re talking largely about material that made the cutting room floor, however serious fans shouldn’t contemplate passing up what’s on offer here. Crucially we’re given more of the most compelling sequences from Made of Stone, seeing the band together playing again. More rehearsal footage is terrific to see especially alongside more from the very first Warrington Parr Hall warm-up gig. A ‘Stoned Love’ tour montage is a welcome touch for those reliving the Heaton Park events and subsequent world tour, although it’s inclusion is intriguing. There was an assumption we might see a live DVD of the gigs themselves eventually, but perhaps given associated content bundled here this won’t in fact materialise. In the meantime there’s at least a full She Bangs The Drums from Fuji Rock festival Japan to sample. One gig film that almost certainly won’t surface though would be 1990’s Spike Island, dubbed at the time as a Woodstock for the Acid House generation. Made of Stone in fact contained newly found “never before seen” silent footage from the show but we get even more of the fan shot goodness in these extras. This is quite frankly the astounding highlight, in all honestly the Roses equivalent of finding those ‘lost’ Doctor Who episodes in Nigeria. While the quality is by no means fabulous, it is better than most would have hoped for and we get numerous snippets of songs for a healthy duration with admirable sound. At last we have an approved document of what this show looked and sounded like and after years of scathing chinese whispers on the performance itself the band seem on top form. We’re told that this is the only remaining video footage, however it is labelled as ‘highlights’ so it seems feasible a full tape exists. If this is the case, even in this amateur form, let’s have it all please! Bundle it with old fan recollections, a documentary and archive news broadcasts and make it download only if you have to but give everyone the chance to experience it. Please! Lastly, aside from more endearing fan interviews, we get the full red carpet broadcasts beamed out via satellite to cinemas on the premiere night. This is a great souvenir for those who went, doubling as a Q&A with Shane Meadows and producer Mark Herbert. The guys go on to reveal much more on the film’s commentary track also, recounting fascinating stories on shooting certain scenes. Which brings us to the film itself which looks faultlessly brilliant, as it should. More importantly though the sound is immense if you’re fortunate to crank it up through a surround setup. The final full gig sequence is breathtaking like this, a fabulous chance to relive the moment for those who were there. Made of Stone is available now on DVD and Blu-ray in several editions.